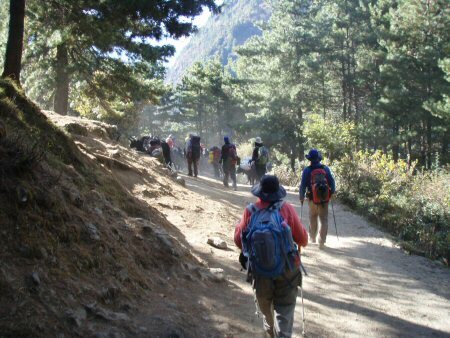 On the main Lukla-Lobuche route, there was a steady stream of trekkers. It was rare to be out of sight of another party. And if you count porters and yak teams, it is doubly true. And for all the trekkers, there were evidently places to stay: we did not see very many others camping in tents. 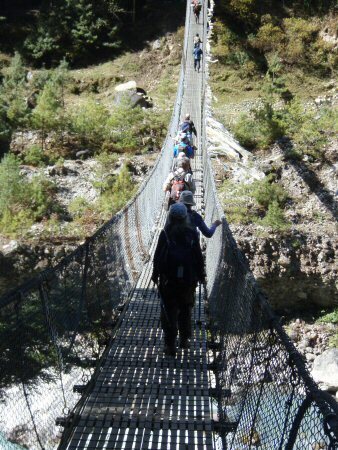 So there were accommodations for the thousands of trekkers we met every day along the way. Accommodations thinned out to some degree as we ascended, but I never felt that I was more than an hour away from a meal and bed. The bed might not be warm, or even the dining room, but it would be there. Many of the accommodations we did explore were not crowded -- many barely occupied by other parties.